Is your law firm stuck on paper? Are your clients seeking a way to access your legal services online? Instead of creating your own online documentation serving platform, why not use one that’s already built and customized for your law firm? 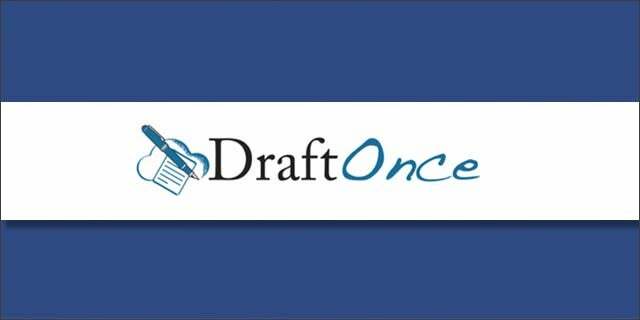 Not only equipped with secure document automation, DraftOnce is also a marketplace for selling your already drafted legal forms. Tech Cocktail: What is DraftOnce? DraftOnce: DraftOnce (@draftonce) is a web-based service for 1-50 person law firms to sell and deliver their own online legal services and to add powerful document automation capabilities to their practices. For publishers, DraftOnce is a new marketplace to sell their legal forms. Tech Cocktail: What problem does your product try and solve? Problem 1 – Traditional legal services are inconvenient: Clients want comprehensive services online and they want to communicate more online, on their schedule. “Come to my office for a free initial consultation” is 50+ year old thinking. Convenience is critical to competing in today’s legal services market. DraftOnce delivers breakthrough online law convenience. Problem 2 – Traditional Legal Services are EXPENSIVE. It’s difficult for most clients to see the difference between a $69 will created online and a $690 will hand-crafted by a local attorney. DraftOnce turns hour-long tasks into 5-minute tasks. Clients want to pay for quality advice, not document production. Problem 3 – Traditional Legal Processes are Outdated: When faced with drafting a document, in the name of efficiency, most attorneys edit an earlier version of a similar document, each time creating a clone that incorporates errors and non-relevant wording from prior versions. Nearly every attorney has experienced sending documents to a client that includes the name of a prior client, leftover from an earlier version. Attorneys who want to be more competitive quickly find that the leading document automation tool, such as HotDocs, are complex to use, require installed software, and are expensive. DraftOnce, by comparison, is easy to use, 100% web-based and inexpensive. Tech Cocktail: Who are the founders of DraftOnce? Erin Martoglio – Co-founder and head of client advisory services, Erin has deep expertise in contract process management, supplier performance management, procurement, and outsourcing. She is part of the design team that created our contract, supplier and form management products. She holds a J.D. from Florida Coastal School of Law, an MA from University of Chicago in humanities with a focus on anthropological linguistics, and a BA from Indiana University in anthropology and a minor in studio art. Erin has recently returned from sabbatical after taking the Indiana Bar exam in July 2012 and is providing management consulting services to our clients. Chris Martoglio – Co-founder Chris has over 20 years of experience helping companies exceed their known potential. He specializes in helping organizations improve their competitive positions by designing and implementing new systems, strategies, ventures, and business practices. He has consulted to over 80 companies, governments and institutions in the U.S., Canada, Europe, Latin America and Asia-Pacific region. Tech Cocktail: Please list three competitors and how your product differs from them. Competitors include DirectLaw, HotDocs, VentureDocs. 1. Provides fine control over the attorney-client online collaboration. Manages what clients can access, sends email notifications and includes quick reference links. It’s a web service for clients to be better self-served. 2. Nothing to install, 100% web-based. 3. Use existing documents and prepare them for uploading in just about any word processor. 4. Is a marketplace for legal content publishers to sell their content in a new, highly usable format. 5. Contains a pay wall that splits payments between attorney revenue accounts and trust accounts. 6. Easily handles the assembly of complex documents with conditional and dependent sections, tables of contents, section and line numbering and embedded graphics. 7. Simple to use—no programming or scripting and little to no training is needed. 8. Low price and low risk to adopt. 9. Security—Hosted in a SAS 70, SSAE 16 (SOC 1) and SOC 2, HIPAA audited and certified data center. All data is encrypted while in transit and at rest; even we can’t see the data. 10. We are not exposed to any claims of unlicensed practice of law (UPL), since only attorneys or publishers will be creating legal content. We simply provide the platform.